New World Library, 9781608685806, 224pp. A successful entrepreneur living in Southern California, Scott Rieckens had built a "dream life" a happy marriage, a two-year-old daughter, a membership to a boat club, and a BMW in the driveway. But underneath the surface, Scott was creatively stifled, depressed, and overworked trying to help pay for his family's beach-town lifestyle. Then one day, Scott listened to a podcast interview that changed everything. Five months later, he had quit his job, convinced his family to leave their home, and cut their expenses in half. Follow Scott and his family as they devote everything to FIRE (financial independence retire early), a subculture obsessed with maximizing wealth and happiness. Filled with inspiring case studies and powerful advice, Playing with FIRE is one family's journey to acquire the one thing that money can't buy: a simpler -- and happier -- life. Scott Rieckens is an Emmy-nominated film/video producer, serial entrepreneur, and author. Scott has spent his career as a storyteller connecting people with ideas. Along the way, Scott's work has generated millions of views through a feature length documentary, multiple televisions series, short films, and a diverse range of commercial projects for Microsoft, NBC, Facebook, FOX, Taylor Guitars, Wired, and others. 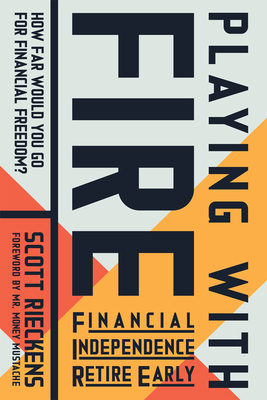 Now, Scott has created Playing with FIRE, which explores the growing community of frugal-minded folks choosing a path to financial independence and early retirement. He and his family reside in Bend, Oregon.